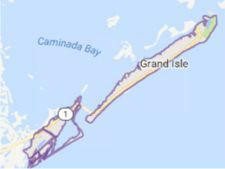 Grand Isle, Louisiana is a barrier island in the Gulf Coast in Jefferson Parish about 50 miles south of New Orleans. It is about 8 miles long and up to mile and a half wide. Prevailing currents and weather activity has caused it to expand and contract as it slowly drifts eastward toward Grande Terre. It has a resident population of about 1,500 which grows to 20,000 in the Summer months.